The Buffalo Sabres ended the 1980’s with three straight playoff appearances which started a streak of eight consecutive, that would eventually end at the conclusion of the 1995-96 season. Things were changing including the team’s logo. The team abandoned their signature logo (which they obviously and thankfully returned to), their blue and gold colors, and traded them in for Black, Red, Gray, and White, and a revised more “modern” logo. They would go through a couple of coaches (and captains) before closing out the decade with a Stanley Cup appearance. As has been the case numerous times during their history, the Sabres traded away their captain again and was in need of naming another one. Mike Foligno was the captain entering the 90’s but was traded away in December of that year to the Toronto Maple Leafs. It was fitting once again, that the Sabres named another one of their first round draft picks as the 8th captain in franchise history. Mike Ramsey was given that honor after playing 12 years for the club. Despite playing in over 1,000 NHL games, Ramsey might be better known for the gold medal around his neck from the 1980 Olympics. He would eventually be traded like the ones that came before him at the deadline in 1993. Mike Ramsey would play in parts of five more seasons before hanging up the skates after two games in 1996-97. He would get back into the game behind the bench of the team that drafted him in 1997. He would head over to the Minnesota Wild in 2000 and would remain until 2010. The next person to wear the “C” on his chest had one of the best offensive seasons in franchise history for the Sabres. 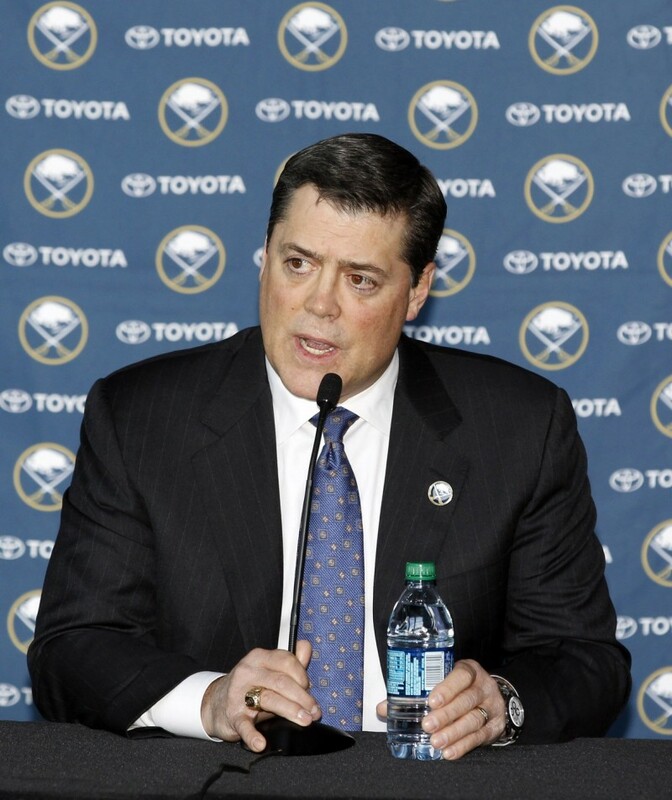 Pat LaFontaine took over the leader role in 1992 and did nothing other than record 148 points. He was second in goals on the team that year with 53 (Alexander Mogilny had 76), but would add 95 helpers. The Sabres would get into the second round of the playoffs before being sent home. 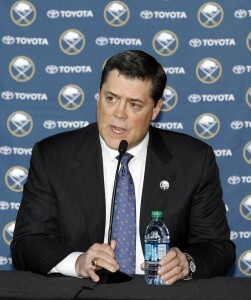 LaFontaine was originally drafted by the New York Islanders in 1983. He was traded to the Sabres in a 7-player deal that sent Uwe Krupp and Pierre Turgeon to the island. He would register 93 points in 57 games in his first season in Buffalo. Unfortunately injuries would force his hand and end his career after 14 seasons. He played his entire career in New York playing for the Islanders, Sabres, and Rangers. Among the many accolades LaFontaine would have in his career, he was inducted into the Hockey Hall of Fame in 2003 and would also have his number 16 raised to the rafters in Buffalo. As we all know, he would make his return to Buffalo last season for a brief stint in the front office before stepping down. LaFontaine was named as the #3 Greatest Buffalo Sabre of All-Time during the team’s 40th season. Due to an injury to LaFontaine, the Buffalo Sabres handed the captaincy over to Alexander Mogilny. Mogilny was a 5th round draft pick of the Buffalo sabres back in 1988 and would play six season with the Sabres notching a franchise record 76 goals in 1992. He would see some of his numbers decline without linemate LaFontaine on the ice with him. The Sabres would trade him away in the summer of 1995.
received they selected Jay McKee. Mike Wilson was eventually traded to the Florida Panthers for Rhett Warrener (who was eventually traded to land Chris Drury) and a fifth round pick in 1999 that the Sabres would use for some guy named Ryan Miller. Mogilny had success away from Buffalo and would play 11 more seasons in the NHL before retiring. Closing out the 20th century, the Buffalo Sabres named Peca the teams captain in 1997. He was an original draft pick of the Vancouver Canucks in 1992 and would play 37 games for them before being traded in the trade with Mogilny. His time in Buffalo was great at times but had a bitter ending. The two-time Selke Award winner for best defensive forward would captain the Sabres during their Stanley Cup run in 1999. A contract dispute would tarnish his time in Buffalo as he would sit out the entire 2000-01 season and was eventually traded to the Islanders. Peca would make it known that he was open for a return to the Sabres in 2007 after the team failed to sign Chris Drury and Daniel Briere to contract extensions. The Sabres passed on it and Peca would become a member of the Columbus Blue Jackets. He would play over 850 NHL games in his career recording 465 points. He was loved as one of their own in Buffalo when the times were good. He even had pickles named after him. I do admit that I had friends who lived in the area that I asked to pick me up jars. They were delicious. Impeccable actually. The Sabres would have such a promising end to the 20th century, but turmoil, embezzling, and bankruptcy would be on the horizon that would change the way this team would do business for quite some time.